Aphrodite’s Daughter, winner of the 2006 XJ Kennedy Poetry Prize, is a feminist study expressed in 38 poems. 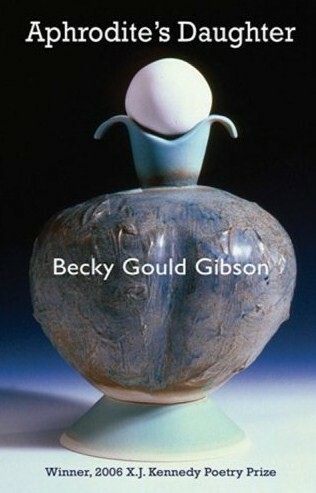 Gibson predominantly uses themes surrounding the relationships of mothers and daughters. The collection also seeks to understand – on a larger scope – the roles women seek for themselves or those which they are given by society. Within the second section, Gould presents individual poems as well as a few sets of poems. There is the Icon series, Postcards from Crete and Triptych. With a strong influence of art and culture, Gould uses biblical references in the Triptych set and ekphrastic references in all three groups within the collection. In “Postcards from Crete,” Gould states in her notes that she has an artistic indebtedness to Carol P. Christi’s 1994 lecture tour of sacred sites in Crete. The juxtaposition and confluence of classical and modern continues to be essential to the overall feel of Gould’s collection. The poems of Aphrodite’s Daughter seek not only to answer what it means to be a modern woman, but also bring into question the history of womanhood, giving birth to a broader sense of what it is to be female.